Provided with 1 relay with programmable timer. If it is in a Alba intercom or videointercom composition, it is able to manage outputs of audio-video Alba module or even up to 4 remote actuators. 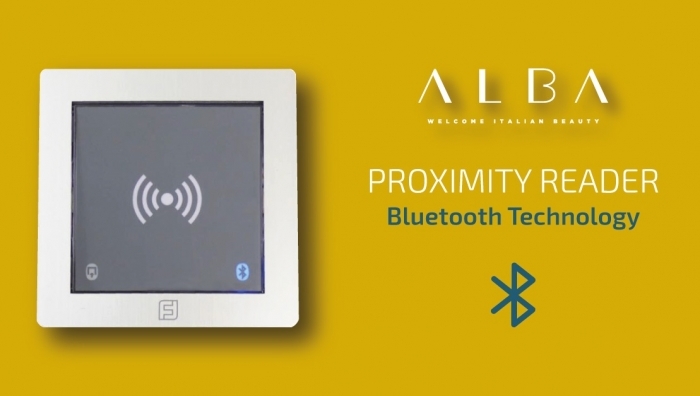 Provided with Bluetooth technology, presently it is used for programming the module, while evolution of the project will include possibility to make access control through the same technology via smartphone. Memory capacity 2000 cards or transponders. Provided with 5 cards. Power supply via Duo bus or through 13Vac transformer in case of stand-alone installation.